As I stated above, I read this because of the BooktubeSFF Awards. I also read Uprooted and A Darker Shade of Magic for this readalong, both of which I expected myself to love, but instead actually sort of disliked. This made me really apprehensive to start Six of Crows, because I literally only wanted the book because it was so aesthetically pleasing with its black pages and beautiful cover. I have not read Leigh Bardugo’s Grisha Trilogy, but I completely intend to fix that after reading this YA book that totally blew me away. Most of the time I think I’ve outgrown YA, or maybe I’ve just become too bitter, but then books like this come along and remind me that I’m just reading the wrong type of YA books for me. Seriously, this book was outstanding, and has some of the most powerful lines I’ve ever read. Like, this is a seventeen year old? I understand she lives a much different life than me, but now I have all these wild fantasies running in my mind of me saying this to someone, trying to be a badass. Maybe when I order pizza and they don’t add my extra pineapple, then I can be like, “I will have you with extra pineapple, pizza. Or I will not have you at all.” and storm out all dramatically, but totally come back because 1.) pizza and 2.) I probably already paid for it. This is the real Melanie, with the hard hitting reviews, people. *Shout out to Anna for taking a screenshot of my snapchat, because I completely forget to save it. Anyways, this is a fantastic book about a heist, even though the majority of this book seems to be leading up to the actual heist. I loved the lead up though, because Leigh Bardugo delivers us an amazing cast of diverse characters that you can’t help but fall in love with. INEJ – She’s my favorite, and not just from her powerful quotes, but because she is selfless while putting herself first. She’d completely sacrifice herself for the good of her team, but she also realizes that she is the only one in charge of her future, and she’s not waiting on anyone to fulfill her destiny. KAZ – He is also known as Dirtyhands, the leader of these crows, and the lieutenant of the street gang the Dreg. You slowly find out about his past and the events that lead up to making him the cold person he is today. NINA – She is a Grisha Heartrender, which means she has power over other people’s bodies and is able to rupture cells, burst hearts, and even take away the air they are breathing. But she can also soothe minds and has minor healing skills that prove very useful. MATTHIAS – Him and Nina have a very troubled and tangled past. He is a druskelle and was a Fjerdan witch hunter. Basically, Grishas hate Fjerdans because they hunt and kill them, and Fjerdans hate Grishas because they are scared of their magic. Obviously Nina being a Grisha make their relationship pretty angsty, but also pretty spectacular and full of all the feels. Matthias is very important to this heist, because he’s the only one that knows the inside of the location the heist is going to take place. JESPER – I freaking love Jesper! He is a Zemeni sharpshooter with a little bit of a gambling problem. He is also harboring his own secret that crew slowly finds out about. WYLAN – At first, Wylan is kind of just used as leverage because of his past, but he soon fits right in with the crew and will find a way into your heart. This crew’s heist is not for an object, but a person. This person has made, but not perfected, a formula for a drug that makes Grishas even more powerful, but at a cost. They will become addicted after the second dosage, and slowly deteriorate from the addiction, or become a weapon of mass destruction if given continual use of the drug. A very powerful man in town is willing to pay a very big sum of money to the crew if they are able to bring him back the person that is being held captive by Fjerdans. This wasn’t the most complex book in the whole world, but this is a wonderful introduction to YA fantasy, especially if you like heists. Some of the plot twists were a little too coincidental for me. Sure, characters should be smart and able to catch lucky breaks, but when they come back to back it becomes a little hard to believe. I will also say that I think this book would have been much better if the first chapter was cut completely. I felt like it was really unnecessary, and sort of made the book even more predictable. This didn’t stop me from being in love with these thieves. I cannot wait for the second installment, Crooked Kingdom, to come out. I also plan on starting Shadow and Bone very soon, because I honestly just need more of this world. The writing is great, the characters are superb, and the romance feels perfect. There are wonderful friendships in this book and each of these characters show a healthy and realistic way of fighting your own personal demons. This book is worth a read, and completely shattered the expectations I had going in. 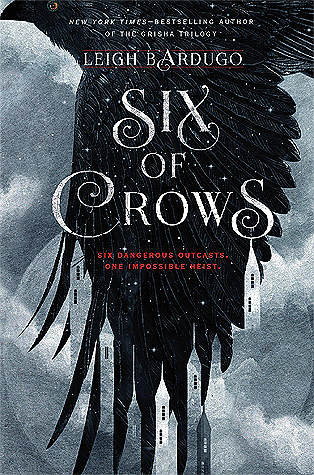 Six of Crows is definitely my choice for Best Young Adult Novel in the BooktubeSFF Awards! 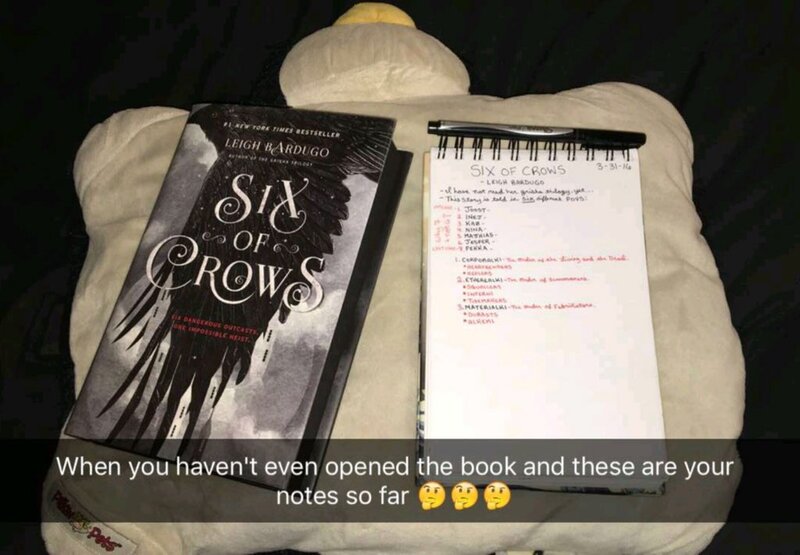 I’ve heard of a lot of people who love Six of Crows but don’t like the Grisha trilogy tho – thought I should let you know. I hope you’ll like it anyway! I’m a little sad that you didn’t like A Darker Shade of Magic and Uprooted tho … they’re on my wishlist as well!